If you’re as into the Porsche brand and all things Porsche-related at we are here at HOUSE Automotive, then you would be very interested in visiting the iconic Porsche Museum located in the heart of Stuttgart-Zuffenhausen, Germany. Aside from their southern neighbors in Münich, Stuttgart is a German automotive capital, home to the likes of Mercedes and, of course, Porsche! 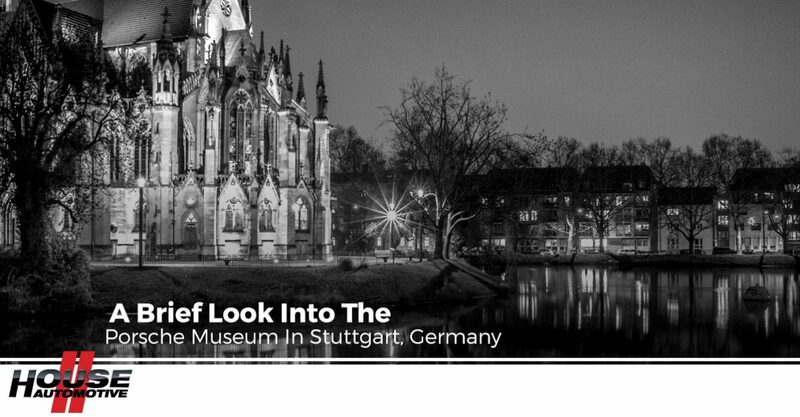 Packed full of legendary Porsche models ranging from the very first production models to hyper-futuristic concept cars and just about everything in between, you should check out the Porsche Museum if you ever happen to be near Stuttgart! Of course, we don’t expect you to be in the area — in fact, we expect you to be somewhere here in Los Angeles, probably fairly close by to our independent Porsche mechanic team here in Pasadena! So, we figured that we could provide our HOUSE Automotive blog readers with a brief “virtual tour” of the Porsche Museum. Continue reading below to learn a little bit more about a place that perfectly encapsulates the heart and soul of our very business. As always, if you’re in need of the very best Porsche factory maintenance from our independent Porsche mechanics, look no further than our Pasadena Porsche repair shop! Hit us with any questions you have, or feel free to schedule an appointment with us today. Before even viewing a single Porsche inside (you’ll see many Porsche driving nearby, trust us), you’ll probably be a little blown back by the incredible architecture of the building itself. Designed by Delugan Meissl, the building is only supported by three V-shaped columns. The museum will trace back the Porsche brand’s history all the way to 1875 — the birth year of Ferdinand Porsche himself. With a model of Porsche that covers most of the years since then, you’ll see everything from wooden wheels to the latest in automotive engineering. It’s hard to describe with words, but Porsche’s milestones are truly a beautiful walkthrough in history with flawless artistic execution. Tastefully switching out Porsche models in order to cover specific topics or meaningful anniversaries, it’s actually worth visiting the museum multiple times throughout your life — especially if you’re a diehard Porsche fanatic (we are!). By dynamically changing out what immaculate Porsche models the public can oogle over, this is designed to reflect the dynamics of Porsche brand itself. This is actually a newer part of the Porsche Museum. As an interactive, multimedia component of the experience, this is a 12-meter long installation that covers some nine decades of automotive excellence and unparalleled styling aesthetics. Users can play with and explore some 3,000 pictures, drawings and accurate technical data that span nearly all of Porsche’s street and racecars. This might not excite the average driver, but this is essentially heaven in our eyes. How about a traveling museum? The Porsche Museum, as we mentioned above, is so much more than a traditional, static experience. Traveling to different areas of the world to convene with fellow Porsche enthusiasts, the Museum on Wheels is unlike any other motoring exhibit in the world. If only they would come to Los Angeles…alas, we digress. We’re thousands of miles away from Stuttgart, but HOUSE Automotive shares the very same heart and soul as the Porsche Museum does. To learn more about the Porsche Museum, visit here, and to get the Porsche factory maintenance your Porsche needs to run strong, schedule an appointment or contact HOUSE Automotive today!